When in the middle of the 60's decade, Algeria become an independient nation, France began the search of a suitable place for the construction of a permanent site to carry out space experiences, to replaced the Saharan polygons of Hammaguir and Colomb Bechar being returned to the algerians. After some feasibility studies, the final election fell on the ultramarine territory of the French Guiana. The new base was installed near the city of Kourou and would be known as the Centre Spatial Guyanais. The construction tasks began in 1965, and after three years of continuous efforts on July 9th 1968, the center was formally inaugurated with the first successful launch of a sounding rocket of the "Veronique" class. Soon other experiences with "Diamant" vectors and "Europe" (a distant cousin of the actual Ariane) would come. Starting on 1969, Kourou facilities were also used to perform stratospheric balloon launches. Among the projects involved in these flights were the experiences "ESSOR" and "ARAIGNEE" wich where some sort of hybrid flights involving balloons launched free wich after reach float altitude reeled down a thether and were anchored to the ground. Also were performed some test flights on the EOLE project, a joint experience with the U.S. around a constant level aerostat denominated ATMOSAT and several test of a balloon of special kind built by ONERA (Office National d'Etudes Et Recherches Aerospatiales) designed to fly in the Mars atmosphere. 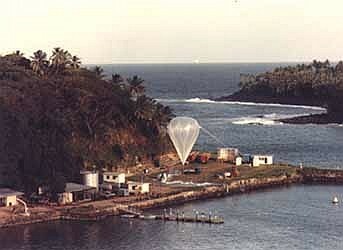 The launchings took place from several points of the immense complex: in l'île Royale (also denominated Devil's Island -see photo-), from the local airfield, from the neighborhoods of the technical center and in the old drop zone for sounding rockets. Up to 1975 almost 80 flights were carried out from those four points. In recent years only conventional meteorological soundings are made during the launch campaigns of Ariane vectors. Nevertheless, there are projects in study to perform again in the future new balloon launchings, taking advantage of the proximity of the Kourou site with the equator.